In the next two lectures we will find out how Alday and Maldacena were able to use the AdS/CFT correspondence to show similar relations in the large ('t Hooft) coupling limit. You can see one of Fernando's talks from when he was visiting last year's string programme in Cambridge here. He's a great speaker and I'm all for the use of blackboard talks whenever possible. A quick snap from last weekend. 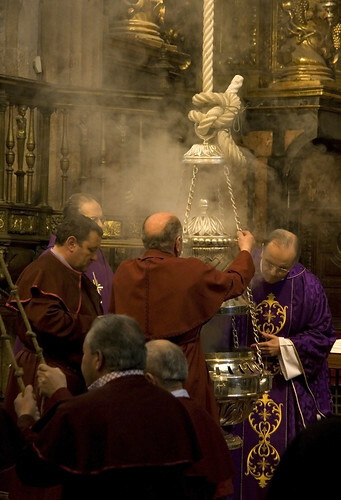 The Botafumeiro was originally put in place to hide the smell of the pilgrims who had spent months on the road on the way to be relieved of their sins. It's still used today, though now it's more of a tourist attraction than a form of air conditioning. It takes several people to lift it onto the huge pulley system and six monks to swing it, and boy does it swing! Have a look here for a simulation of the movement and a brief explanation of the mathematics behind it - I'm afraid my French is a little rusty to give a full translation. Anyway, I took the following photo while they were loading the Botafumeiro. and a couple more here. What's the p.t. Captain Cryptic? It's the religious path which people take to relieve them of their sins. It ends in Santiago de Compostela. I don't want to use the name explicitly because already trying to Google this city and wading through every man and his dog's site about the p.t is tough. Adding more noise to the search results won't help matters. If I can get Santiago known for being a beautiful place, with rich culture, a good social scene and a top-notch physics department then I'll be very happy.